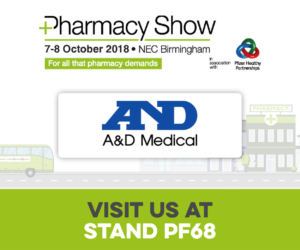 We are delighted to let you know, that we will be exhibiting at The Pharmacy Show in Birmingham at the NEC on Sunday the 7th and Monday the 8th of October 2018. You can find us at Stand PE15 as per the link below. Please register for free and meet our A&D Medical Team. We are looking forward to see you there!